How do you create a breakthrough to achieve fuller employee engagement for yourself and the people you work with? Often we feel stuck or disengaged. We want a breakthrough. But we are not sure how to proceed or even get started. 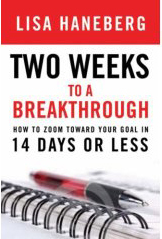 Lisa Haneberg offers a solution in her book: Two Weeks to a Breakthrough. Lisa moves beyond simplistic pop psychology or self-management and offers a very practical and explicit method to get fully engaged. She recommends taking 2 weeks to create the breakthrough and gives you guidance each day on how to proceed. The daily practice is the key to move beyond dreaming of change and breakthroughs to zooming towards your goal. Share-Action-Request makes our breakthrough method public, tangible, and connected. I know one of the first times I tried this method I let the sharing part of the method slip. I thought I could just do it on my own. I now realize how important this was to create what I call an accountability allies – others who will both support and challenge me on my work. You will get specific about what you are trying to achieve. You will be talking with many people about your plans and actions to foster fuller employee engagement. You will be taking multiple actions to increase engagement. You will be requesting help – full employee engagement can not be achieved on your own. You can monitor the progress and results. One thing I love about Two Weeks to a Breakthrough is how short it is. If you did not get the results you hoped for you can start again with a fresh two weeks and use what you learned from the last breakthrough approach to ensure more success. Fostering high levels of employee engagement will be both a service and a contribution you make to your employees and the organization. How about it? What are you planning to do for the next 2 weeks? I hope you make a break for full employee engagement. Read Lisa’s book: Two Weeks to a Breakthrough. Visit and engage in Lisa’s breakthrough blog. Learn from your own experience, apply the method and monitor results.